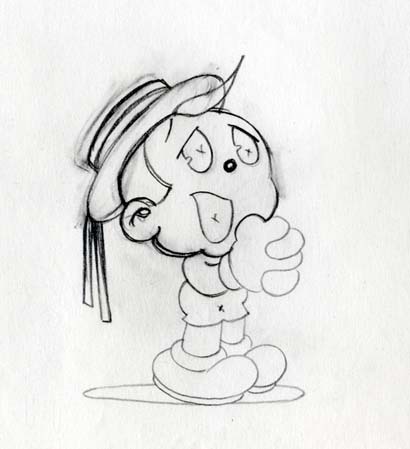 I don’t know how much original Scrappy production art survives–for all I know, Columbia has a vaultful of the stuff–but it’s safe to say that it’s not exactly plentiful on the open market. I do own one piece that seems to have been prepared for a book. 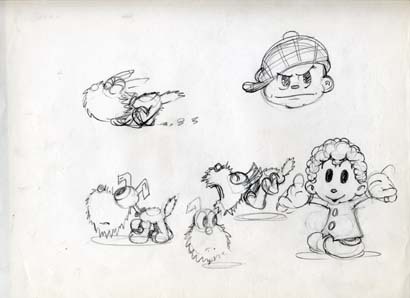 In all my time as a collector of Scrappyana, though, I’ve run across only two pieces that seem to have been done during production of a cartoon–one of which was gone before I found it, and the other of which I was foolish enough to let out of my grasp. Until this weekend. Within ten minutes of arriving on the floor of the dealer’s room at the San Diego Con, I was rifling through Scrappy drawings. Maybe I’ve developed some sort of weird Sixth Scrappy Sense. True, the seller, who said that they came from Pete Burness’s collection (did he ever work for Mintz?) also told me they were from Willie Whopper cartoons. But I knew better, and now they’re mine. 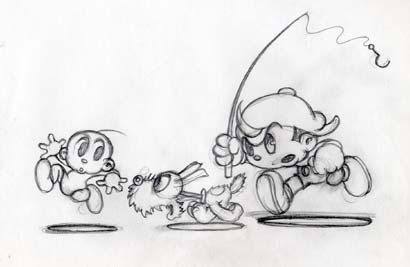 It’s been almost a year since my last significant update to Scrappyland–but I’ve begun work on a version 3.0 that’ll feature these and other recent additions to the archives. Meanwhile, does anyone else out there have more information (or informed speculation) about these pieces? Hi Harry. Are there any numbers or inbetween spacing charts on the first two drawings? Anything on them besides the images that you’ve printed? Hi, Mark: The second drawing has a number in the upper right-hand corner; the other two have no other markings other than what I’ve shown.